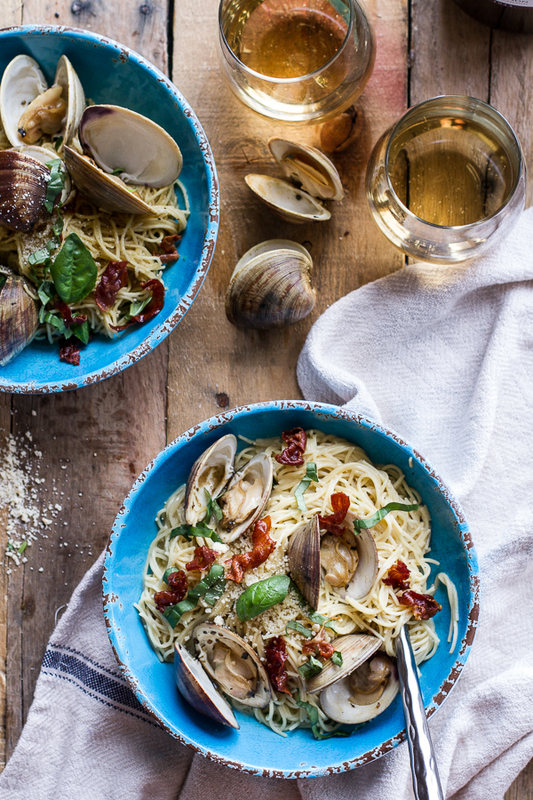 Surprisingly, clams are really easy to cook. Double the surprise though? I actually really like clams. Before this recipe, I had only eaten clam chowder. Give it a try - you will be glad you did. Place a large saute pan over medium heat. Add a drizzle of olive oil and once hot add the prosciutto. Let the prosciutto get nice and crispy, about 2-3 minutes per side. Remove and drain on paper towels. To the same skillet add in a drizzle more of olive oil. Toss in 4 cloves of garlic and cook over medium heat until fragrant and golden brown. Remove the garlic from the skillet (leaving the oil) and discard. The garlic will infuse the oil with flavor. To the same skillet add 2/3 of your clams, the white wine, water and a pinch of crushed red pepper flakes. Cover the skillet and let the mixture simmer for about 10-12 minutes or until the clams open. Remove the clams from the pan, let cool and set aside. Once the clams cool, remove the clam meat from their shells. Meanwhile bring the remaining liquid to a boil and let it reduce by about half. Once reduced, pour the liquid through a fine mesh strainer and into a bowl. Reserve the clam liquid for later. Back in the same skillet add another drizzle of oil. Add those remaining 4 cloves of garlic and saute until fragrant and golden brown. Again, remove the garlic from the skillet and discard. Add the remaining clams and the reserved clam cooking liquid. Cover and cook ten minutes or until the clams open. Meanwhile drop your pasta and cook until al dente. Drain. Once the clams in the skillet have opened and are cooked, remove them from the skillet. Reserve the clams for serving. Now add the shelled clams (so just the meat, no shells) back to the clam liquid. Now add in the butter. Allow to cook 2-3 minutes and then toss in the pasta, heavy cream, parmesan cheese (if using) and fontina cheese (if using). Toss well until the pasta is coated in cream sauce and the cheese has melted into the sauce. Remove from the heat, add the basil, parsley, oregano and some fresh pepper. Toss well. Garnish the pasta with the cooked clams in their shells (first batch). Serve right away with fresh pepper and basil.